When gutters are working as they should, most people probably don’t give them must thought. After all, gutters are above our eye-level, they don’t require daily care, and they usually do their job effectively and quietly. But every so often you may wonder: how often you should clean your gutters? Why? Here’s a quick primer. 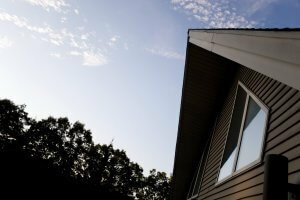 The frequency with which you should clean your gutters will depend on a number of factors. However, as a general rule you should have gutters cleaned at least twice a year: in the spring and in the fall. Making this chore a part of your spring cleaning and back-to-school prep can help you remember to keep to the schedule. However, that’s not the final answer. Are there a lot of trees near your roof? Have you had a lot of rainfall lately? if you live in a particularly wooded or rainy area, you may need to adjust and clean your gutters more often. Don’t forget that there are other environmental factors to consider. If your house is surrounded by lots of pine trees, you’ll want to keep an especial eye on your gutters. Pine needles shed year-round, and there are so many of them! On the other hand, if you live in a very cold area, watch out for ice in your gutters during the winter. Ice can be very destructive if unchecked. Dirty, full gutters can cause any number of problems. Aside from expensive and time-consuming structural damage, standing water encourages mosquitoes, bugs, mold, and disease. Don’t let this happen to you! Keep your gutters in good repair, and when it’s time to replace them, call McCann Windows and Exteriors in Northbrook, IL!